To be internationally competitive and locally relevant. To be the first port of call and satisfy the needs of the water sector in South Africa. The Institute for Water and Wastewater Technology (IWWT) was founded as a research institute as the Centre for Water Research in mid 90’s and subsequently became the Centre for Water and Wastewater Technology. It is one of 13 NRF recognized research niche areas and was granted institute status in 2011. This organization, based at Durban University of Technology, has over the years developed into a “Centre of Excellence” and proficiency. Our focus is largely based on developing and optimizing technology for the treatment of water and wastewater, and green energy to satisfy the needs of industry and the community. Research projects are selected and designed in close consultation with industrial partners with the aim to help industries maintain acceptable levels of effluent discharges and to meet increasing energy requirements. This plays an essential role in reducing negative environmental impact and commercialization of products generated from waste streams. The strength of the Institute lies in its commitment to develop essential skills through student training. This effectively equips the researcher to venture out into industry and satisfy the much needed human resource requirements of the water sector. 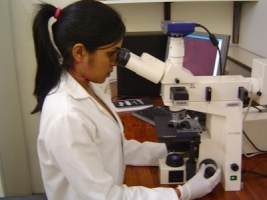 Due to the multi-disciplinary nature of the research, the Institute offers post graduate programmes in a wide spectrum of disciplines in Science and Engineering. It accepts postgraduate students whose qualifications are registered in a variety of departments such as biotechnology, chemistry, civil and chemical engineering and environmental health. IWWT post graduate student base comprises local as well as international students. Postgraduate students are trained and developed to satisfy the water and wastewater human resource needs of industry in general. Staff members are further trained by attending workshops and courses as well as international visits to the laboratories of our collaborating partners. The recent progress/contribution of the institute is a fascinating chapter in the story of higher education and scientific research in Durban University of Technology. To date the IWWT has hosted 16 Post-Doctoral Fellows from reputable international institutions, 14 Doctoral students, 30 Masters and 45 B.Tech students. Publishing research articles are a core part of the research carried out at the Institute with a total of 85 research articles, 6 book chapters, numerous technical reports and national and international conference presentations to its credit. Our research facility will be moving to bigger premises in the near future. The construction of this building is set to commence in early 2015 and this project has been funded by the Department of higher education and training. To date the IWWT has hosted 11 Post-Doctoral Fellows from reputable international institutions, 14 Doctoral students, 30 Masters and 45 BTech students. Publishing research articles are a core part of the research carried out at the Institute with a total of 51 research articles, 3 book chapters and numerous technical reports being published and local and international conference presentations. Due to the multi-disciplinary nature of the research, the Institute accepts postgraduate students whose qualifications are registered in a variety of departments such as biotechnology, chemistry, civil and chemical engineering and environmental health. IWWT post graduate student base comprises local as well as international students. Postgraduate students are trained and developed to satisfy the water and wastewater human resource needs of industry in general. Staff members are further trained by attending workshops and courses as well as international visits to the laboratories of our collaborating partners.